If you're a musician or DJ who is on a budget, who needs reliable, high-quality loudspeakers for playing live, and who also is something of a do-it-yourselfer, then this book was written especially for you. 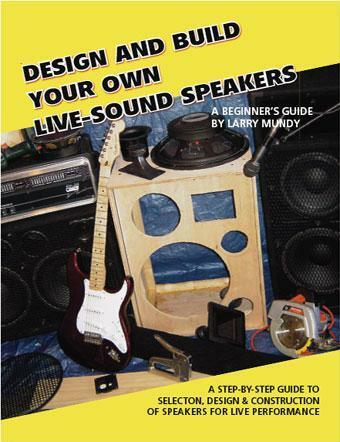 It's a step-by-step guide that allows even beginners to select, design and build speakers for use in stage performances. The author, Larry Mundy, is a "weekend musician" who has years of hands-on experience building speaker cabinets and has published several articles about speakers at Shavano Music and Disc Jockey 101, among other websites (see article links). What makes his book different from others of its kind (most musicians will be happy to learn) is that he wrote it with the performer's needs in mind, including, for example, the need to keep speaker weight and size down as much as as possible for easier portability. For that reason, he pays only a minimum amount of attention to concepts and theory, no more than enough to lay the groundwork for understanding the fundamentals of speaker technology and to get you started. Instead, he focuses mainly on speaker-building techniques, tips and shortcuts which require only the most basic woodworking and hand tools. In spite of that simple focus, his discussions are thorough and provide enough flexibility to encourage you to come up with your own designs to meet your own needs. Topics include: types and selection of drivers, enclosure design and construction techniques, wiring and connectors, crossovers, bi-amping, reconing, rack case construction, sample projects, sources for finding parts and computer-modeling programs, and much more. In fact, he covers everything you need to know to design and build a durable and efficient speaker system that can rival or exceed the quality of many commercially manufactured systems, and at a much lower price. Like his articles, the book is very clear and easy to follow, and it includes a large number of well-chosen illustrations, diagrams and charts. There are, for example, charts for finding choke and capacitor values for crossover parts, which can be particularly helpful to novices. Even if your purpose is limited only to improving or modifying a speaker system, or to preventing or repairing damage caused by electronic or physical abuse, he provides a host of expert information and advice throughout the book which answers many of the questions musicians most commonly ask about speakers. That information alone can save you a lot of money and is easily worth far more than the price of the book. Price: US$19.99, C$25.99, EUR16.99, �11.99. Order directly from Trafford Publishing.